A few months ago, I learned of the stunning archival holdings at the University of South Carolina's Moving Image Research Collections. Thanks to the invaluable help of Production Manager Ben Singleton, I had the chance to review some amazing baseball footage, part of the Fox Movietone News outtakes that were donated to USC back in the early 1980s. When you think about it, this collection of footage is doubly rare. Certainly, very few people have seen the film today. But, since this footage didn't make the cut for the original Movietone News reels shot in the 1920s and '30s, it is likely that few beyond a handful of editors actually saw this footage back in the day. Given my interest in baseball history, I was entranced by most every frame I viewed, but I was especially fascinated by some footage marked A7378 to A7382. The date associated with the footage was noted as June 1, 1925, but my experience researching some other footage in the collection taught me that these dates did not necessarily correspond with the date the film was shot. For example, different footage (A4510) marked "November 7, 1924" clearly showed Babe Ruth at Washington Park in Los Angeles. But Ruth's appearance there was on October 27, not November 7, 1924. There's no question about the identity of the man with the bat. His powerful upper body, his grip at the very end of the bat (unusual for the time), his distinctive stance and swing. It's clearly Babe Ruth. The Babe is wearing Yankee pinstripes, so going on the tentative assumption that action is from June 1, 1925, this would imply the game took place at Yankee Stadium. After a number of pitches, Ruth finally hits a fair ball and begins running towards first. As the camera follows him towards first, he slows down, turns towards the third base line and heads to the Yankees' dugout, obviously having grounded out to end the inning. As he starts across the diamond, the pitcher for the Senators heads towards the first-base visitors dugout. His lanky form is unmistakably that of pitching legend Walter Johnson. 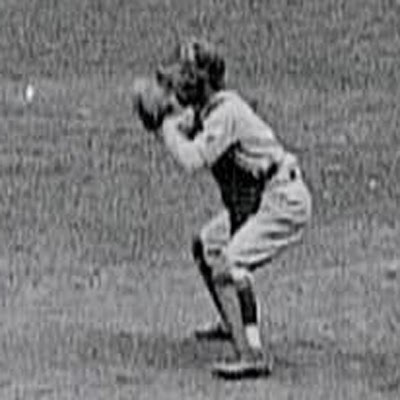 Certainly Ruth faced Johnson a number of times at Yankee Stadium in 1924 and 1925, but thanks to Dave Smith of retrosheet.org, I was able to confirm that the footage was indeed from June 1, 1925. First, it was easy to verify that Washington played at New York on June 1, 1925. Second, play-by-play from that game corroborated perfectly with action from the at bat captured in the footage. Ruth came to the plate three times in the game. His first at bat occurred in the second inning as he led off with a grounder to Johnson. 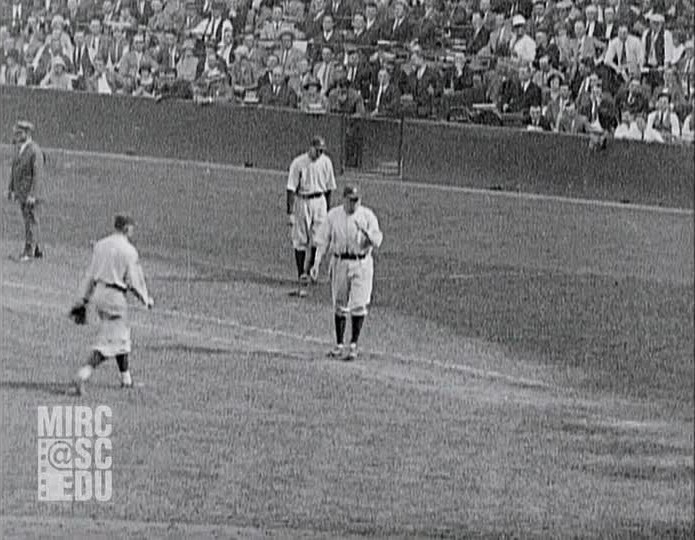 Since it was the first out of the inning, it was not this plate appearance that we see in the Movietone outtake. His second time up came in the fourth inning and resulted in a walk. Also not a match. Ruth's final trip to the plate came with one out in the sixth inning, with teammate Earle Combs already on first base. According to the play-by-play account, Ruth grounded out to second base. This matches nicely with what we see in the footage. But it is another part of the at bat that ultimately convinced me that we're seeing action from the June 1 game. At one point in the footage, with the count 2-and-1 on Ruth, we see the Senators catcher receive a pitch from Johnson (ball three) and then quickly fire the ball toward the infield. His throw is nothing like his normal, leisurely tosses back to Johnson. It is clearly a throw to second base. This corroborates perfectly with the play-by-play from the June 1 contest which notes that, during Ruth's at bat, Combs tried to steal second, but was retired: catcher Muddy Ruel throwing to shortstop Roger Peckinpaugh for the putout. A perfect match between footage and play-by-play. There's no question that we're seeing Ruth's sixth-inning at bat on June 1, 1925. One key to dating early baseball footage is to ask oneself, "For what reason did the news service want to cover what we're seeing?" Unlike the situation today, where it seems that everyone and everything is captured on video all the time, in these earlier days, a conscious decision was made before sending a cameraman and equipment out on assignment. But what was so special about this June 1, 1925, game that footage would be wanted? Why cover this contest? For the answer, we need to look back to early March of that year. As was often the case throughout his career, Ruth fell ill during spring training. However, this time his sickness was much worse than usual. The Babe was hospitalized and ultimately required surgery. Rumor had it that the Babe had serious digestive problems, brought upon by overeating, but this was a charge that Ruth himself denied. Nevertheless, sportswriters quickly dubbed the illness "The Bellyache Heard 'Round the World." The result was that the Yankees lost their star (and biggest drawing card) for the first month and a half of the season. Given that Ruth was the most dominant player of his day, most anything Ruthian was worth capturing on film. But it was simply a "no brainer" to send a cameraman over to Yankee Stadium in the spring of 1925 to cover Ruth's first game back after a long, serious illness. Behind Ruth, at far left, is a familiar Yankees player: Lou Gehrig. The previous season, Lou had a breakout year with Hartford of the Eastern League, batting.369 with 37 homers in 134 games. But at the moment we see Lou on the bench behind Ruth, Gehrig had played just 11 games with the 1925 Yankees, posting a meager .174 average while seeing intermittent action as an outfielder and pinch-hitter. That afternoon, just two innings after Ruth's ground out had been captured on film, Gehrig was sent to pinch-hit for shortstop Pee Wee Wanninger. Lou flied out to Goose Goslin in left field. But more importantly, it was the first game in which he had participated in four days. The next day, Gehrig started at first base, went 3-for-5 at the plate, and didn't take another day off until May 2, 1939. 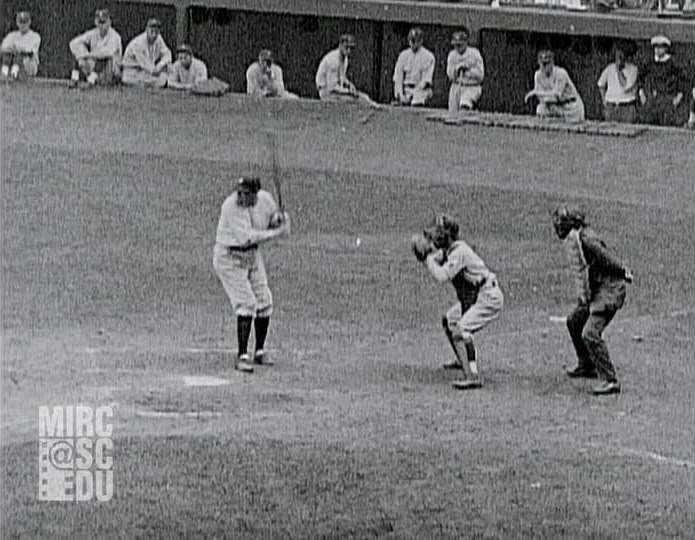 In short, not only does the footage capture Ruth's return to the Yanks in 1925, but it also gives us a glimpse of Lou Gehrig on the very day he began his famous streak of 2,130 straight games played, a mark that remained unbroken for well over half a century. In hindsight, some very fortunate footage shot by a very lucky Fox Movietone cameraman. Thanks to Ben Singleton at University of South Carolina's Moving Image Research Collections, here's a portion of the historic footage discussed above. The first scene is Ruth's sixth-inning at bat that, by comparing to the play-by-play data, helped confirm the date of June 1, 1925. The second scene shows Ruth outside the Yankees dugout prior to the game. 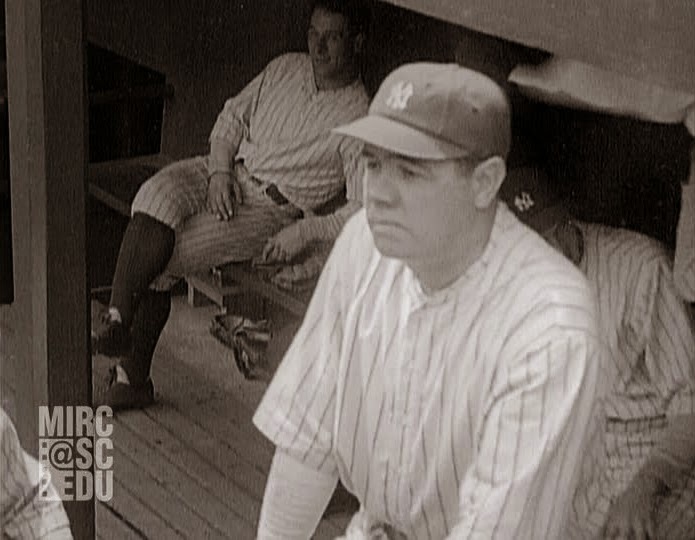 The final scene shows Ruth in the dugout, with Lou Gehrig in the background at far left. Enjoy. 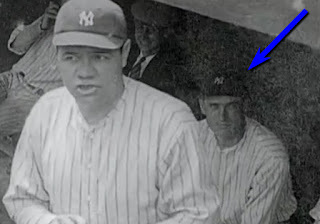 For the final scene in the footage above, I had previously misidentified the player behind Ruth in the dugout and at far right (see blue arrow below) as Earle Combs. In fact, the player is Wally Pipp, ironically the very Yankees first baseman whose job was taken over by Lou Gehrig! Nice job Tom! One of baseball's premier researchers does it again. On a side, at first glance, it almost looks like Gehrig is holding a cell phone to his ear, no? I think it might just be an itch. I thought cell phone, too, when I saw the captured frame. 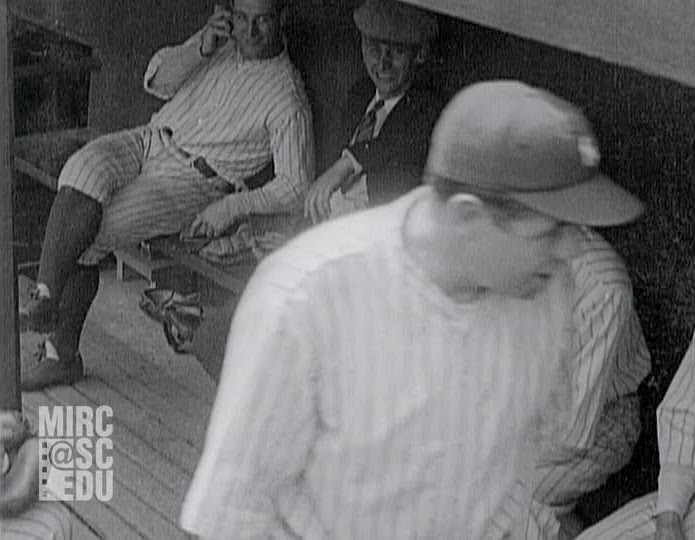 Weirdly, in the moving footage, Gehrig's body language looks even more like he's holding up a cell phone. Such whimsy aside, what a remarkable bit of sleuthing, decoding, and then confirming by Mr. Shieber. Many thanks. Gehrig with a cell phone, that was my first reaction as well. Very cool video. Thanks for sharing! We're lucky to have a researcher like you Tom! That University of South Carolina is really outstanding. I meant to say that the website of U.South Carolina is really outstanding. There's some really incredible footage in their archives, great find! What is with the guy continually waving the towel behind Ruth? Had the Bane passed gas? Saw this on Olbermann tonight - my wife said you gotta see this ... she and I both got goosebumps by the whole thing. that Babe Ruth doesn't hustle enough for my liking. I'd never want him on my team! I thought that too! The media totally overdoes the respect for the game thing. Players were players then as now. I'm amazed at how behind the plate the catcher and umpire are for Ruth's at-bat. In fact, the umpire is so far behind the plate (he must be 10 feet) that I wonder how he could call balls and strikes. He's also being blocked by the catcher who is not crouching. And the Senators walking off the field barehanded. I wish I were a lip reader to know what Babe was saying in the dugout. Gehrig seems to be laughing at whatever was going on at that end of the dugout. At that time, if I am correct the teams shared gloves. The team leaving the field would leave the glove and the other team would use them. I have heard that. Do not know if its true. Gloves were left on the field ata the end of the inning. So why was Ruth headed for the dugout? At the time, gloves were often left on the field after the inning was over, but opposing players most certainly did not share gloves. As for Ruth heading to the dugout after his at bat: he was the third out, so the inning was over. But his glove was probably on the field. What was he going to the dugout for? They certainly didn't wear multiple gloves, a shin guard, and a helmet. A couple of possibilities and, perhaps tha answer may be a combination of a few. First, not all players left their gloves on the field. Second, Ruth was removed from the game at this point. He was clearly not yet in shape for a full game, and had over-exerted himself earlier in the game with a long-running catch and a base-running play at the plate. In fact, it was not unlikely that he knew that his at bat would be the end of his day. Gave me goosbumps to watch this....thanks so much for sharing. Note Ruth's belt buckle off to the side of his body..Thanks so much for this!!!! WOW! I've never seen a Ruthian swing in an actual Babe Ruth at-bat. Amazing stuff. I've just watched the clip five straight times. Love this stuff. And did anyone notice the muscles of Gehrig's legs?!? No wonder he could play in 2,130 straight games without all the luxuries and conditioning ballplayers have today. Fascinating stuff. Very cool to see Walter Johnson, too. In those days the defensive players left their gloves on the field at the end of each half inning, that's why they're barehanded. Not a big B-ball fan but very enjoyable and thanks for your considerable efforts. Loved this. Ruth batted fourth in the line-up in this game. In the bottom of the sixth, Joe Dugan led off with a single, but was forced out at second on Combs grounder. That's when Ruth came to the plate. If it was Yankee stadium then why would Ruth and others on his team be seemingly heading towards 3rd base dugout which is now typically the AWAY team? The Yankees occupied the third base dugout from the opening of Yankee Stadium in 1923 until (I believe) the mid-1940s. What I noticed about this clip is that Ruth did not run out the at bat to first base and beyond. He stopped 1/2 way to first. Hard to believe, but he was the Manny Ramirez of 1925. Let's remember that we're seeing just one at bat in Ruth's first game back after a major illness and surgery. What we're seeing in this footage is by no means the "normal" Babe Ruth. Here's what New York Times sportswriter James Harrison wrote the day after the game: "Slimmer and weaker, his face drawn and his legs so feeble that they could barely carry him over the ground, baseball's greatest invalid came back yesterday to grace the diamond again. ...Ruth is starting at scratch. ... He was in no condition to play. His heart and arms and shoulders may have been strong but his legs were terribly weak. He could scarcely run faster than a dog trot. As he moved over the ground his legs churned up and down like those of a runner in distress." And yet, despite the fact that the Yankees lost the game, even a significantly hampered Babe Ruth contributed a great deal to the club. No, Ruth was by no means slacking off. In fact, he was doing all he could to help his club win. Tom, thank you very much for making the film available. It's an awesome experience watching Ruth bat against Johnson! Don't think anyone mentioned that the players had no numbers on the backs of their jerseys. When did Ruth become #3 and Gehrig #4? I believe that when numbers were first put on the backs of the jerseys they corresponded to the player's position in the lineup. Hence Ruth #3, Gehrig #4. The Yankees first donned uniform numbers on the back of their uniforms in 1929. Was Ruth thrown out at the plate after walking in the 4th? If so, I believe there is footage of this play also. You mentioned above that Ruth was involved in a play at the plate. I believe the beginning of that play is on the University of South Carolina video at 3:33 to 3:40. Just before, at 3:17 to 3:33, Ruth is batting with a man on first (box score indicates Combs). Ruth is drawing a walk, but all we see is him hitting a foul beyond third baseman Bluege, and a pickoff attempt at 1st. Then at 3:33 the video jumps to Ruth heading from 1st to 2nd on Meusel’s double to right center, which drives in Combs from 2nd (off camera). The distant camera shot shows center fielder Rice run nearly to the top of the hill between the track and the wall to retrieve the ball and second baseman Harris run out to short right center to take the throw. As the sequence cuts at 3:40, Ruth is nearly to 3rd, Meusel is reaching 2nd, and Ruel stands ready at the plate. It looks like Harris has his back to the infield still awaiting Rice’s throw. A Yankee at home is holding a bat, perhaps Combs after scoring, but I think it’s the next batter Pipp. Walter Johnson appears to not know which base to back up and has only drifted half way toward 3rd during this part of the play. Wow, what a dramatic finish! Ruth charges around 3rd past his coach (can’t tell what signal he got) and looks over toward Harris. Johnson sees the play will be at the plate but is too late to back it up and has to stop at the front of the plate just before Ruth arrives. Ruel receives the throw on the first base side and lunges headfirst toward Ruth who has hurled himself headfirst at the plate. Ruth and Ruel manage to avoid cracking heads together and both look up to see umpire Evans clearly signal OUT! Ruth’s head falls back to the ground and he lies there for a moment, with Johnson and Ruel looking concerned, but then he pops to his feet and Pipp sends him back to the bench. What do you think, have I got it right? Sounds right to me. Nice work! I just discovered your blog, and I'm having a great time catching up with your fantastic research!